We are happy to receive guests from all over the world! - SPA-day for women and men – great opportunity to relax and restore, if you came to our city for business or just travelling! - wide assortment of cosmetics for home use. estheticians and cosmetologists consists of professionals with medical education, who went through serious selection process and is worth to present techniques of the genuine Ural massage. 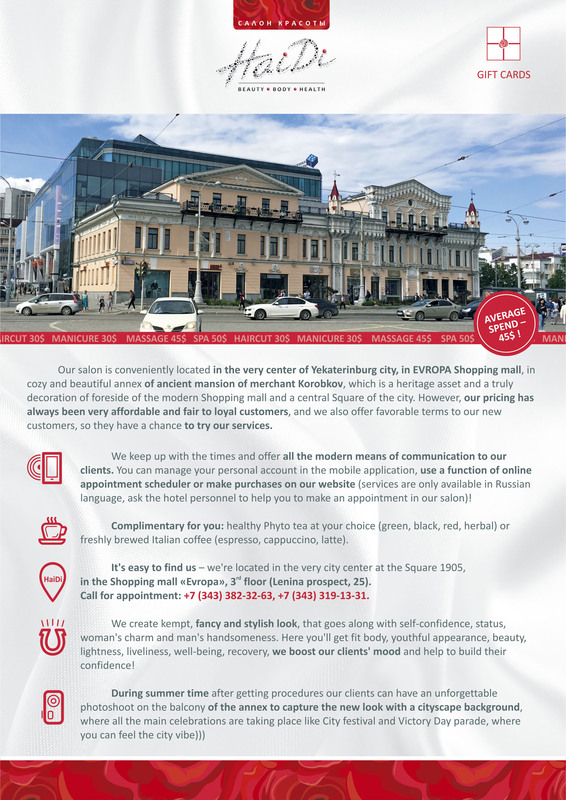 Our salon is conveniently located in the very center of Yekaterinburg city, in EVROPA Shopping mall, in cozy and beautiful annex of ancient mansion of merchant Korobkov, which is a heritage asset and a truly decoration of foreside of the modern Shopping mall and a central Square of the city. However, our pricing has always been very affordable and fair to loyal customers, and we also offer favorable terms to our new customers, so they have a chance to try our services. We keep up with the times and offer all the modern means of communication to our clients. You can manage your personal account in the mobile application, use a function of online appointment scheduler or make purchases on our website (services are only available in Russian language, ask the hotel personnel to help you to make an appointment in our salon)! Complimentary for you: healthy Phyto tea at your choice (green, black, red, herbal) or freshly brewed Italian coffee (espresso, cappuccino, latte). It’s easy to find us – we’re located in the very city center at the Square 1905, in the Shopping mall “Evropa”, 3rd floor (Lenina prospect, 25). 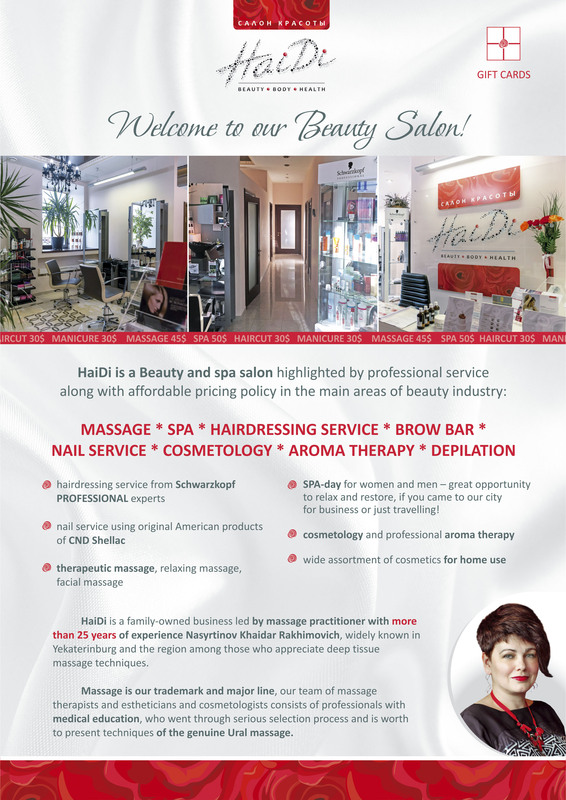 Call for appointment: +7(343)382-32-63, +7(343)319-13-31. We create kempt, fancy and stylish look, that goes along with self-confidence, status, woman’s charm and man’s handsomeness. Here you’ll get fit body, youthful appearance, beauty, lightness, liveliness, well-being, recovery, we boost our clients’ mood and help to build their confidence!